BIGGEST INFLUENCE: "My parents & siblings." 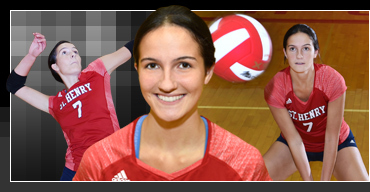 One of Northern Kentucky's premier volleyball players is St. Henry senior Maria Tobergte, a four-year starter for the Lady Crusaders, who were last year's Kentucky All-A state champions and the defending 9th region champions. Maria recently led her squad in this year's 9th Region All-A championship and she was named MVP of the All-A Regional tournament. In 41 matches last season, Maria led the team in kills (477) and digs (415) plus she recorded 36 blocks and 35 aces in leading the team to a 32-9 over all record. Maria has earned numerous honors for her stellar play, including last season being named Kentucky Volleyball Coaches Association 9th Region Player of the Year and first team all-state for the second time. She was also Northern Kentucky Div. II Player of the year for the second time, MVP of the Kentucky All-A state tournament, the Cincinnati Enquirer's NKY Player of the Year and a finalist for the Cincinnati.com Sports Awards Volleyball Player of the Year. Also a varsity bowler, Maria is a great student with a 4.2 GPA and is active in community service. She will play volleyball collegiately at the University of Cincinnati. Her favorite athlete is Tom Brady, favorite entertainer is Kevin Hart, favorite book is A Separate Peace, favorite movie is The Proposal and most-like-to-meet is Kendall Jenner. COACH'S QUOTE – "Maria is a well rounded elite player who practices relentlessly to improve her game. She also has a remarkable gift of giving grace to those around her while pushing them to achieve more as a team."